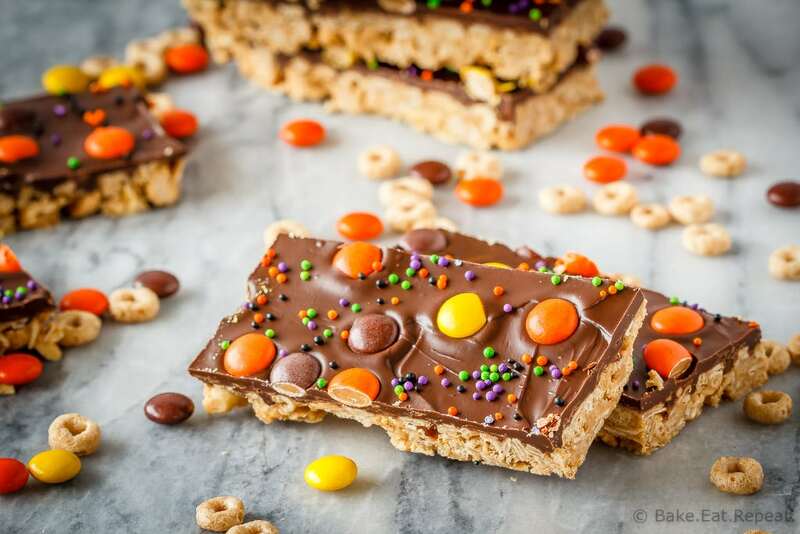 These crunchy chocolate peanut butter granola bars use cereal and oats for an easy, no bake treat – with yellow and orange candy for a fun Halloween snack! Disclaimer: This post was sponsored by Life Made Delicious as part of their #CookUpIncredible campaign, and I have been compensated for my time. All opinions are, as always, my own. Easy as can be, chocolate peanut butter granola bars. That’s what I have for you today. And yes, usually granola bars are a healthy snack. I realize that. But…. I’m sorry. These aren’t so much. They would be fairly healthy if you skipped the layer of chocolate and candy though. But then they wouldn’t really work as a cute little Halloween treat. 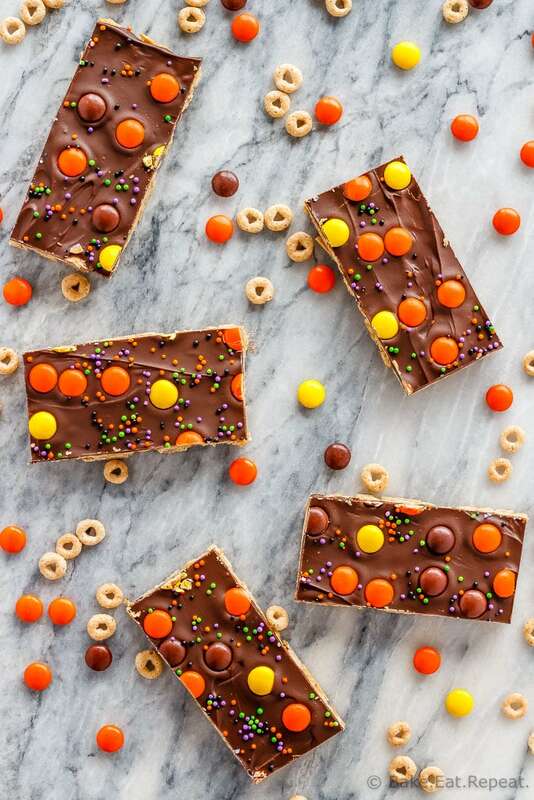 They’d still be really tasty though, so if making cutesy Halloween treats isn’t your thing, you could totally just make these as peanut butter granola bars and skip all the rest. In fact, that’s how I’ve made these in the past. I’ve been making different variations of this recipe for years. One of my favourite versions are these Cherry Almond Granola Bars, but this new chocolate peanut butter version may replace it. Less healthy, sure – but oh so yummy. They’re almost like a candy bar, but with oats and cereal in them so you can pretend they aren’t that bad. That’s how I operate, at any rate. These chocolate peanut butter granola bars use oatmeal, peanuts and Cheerios in them, with peanut butter and honey binding them together – a no bake treat that is super simple to whip up. Using Cheerios in them makes the bars nice and crunchy, which is why I like using them. Granola bars made with just oatmeal tend to be chewy, and we enjoy the crunchiness that the cereal adds to these bars. 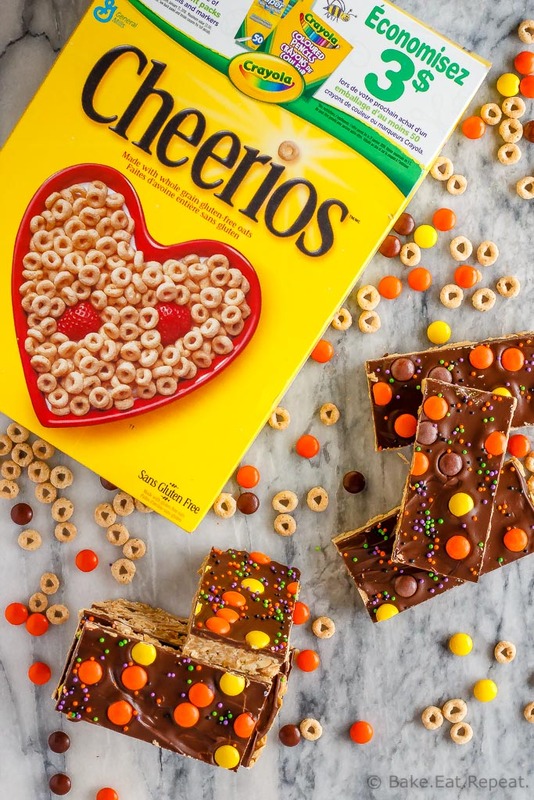 With Cheerios in the bars, they aren’t made entirely from scratch, but adding them is an easy and delicious way to get the texture that I wanted. So if you’re looking to make life delicious this year with an easy, fun Halloween treat for the kids (or yourself! ), try these chocolate peanut butter granola bars. Making granola bars with cereal might be new to you, but I promise you, they’re delicious! Crunchy, peanut buttery, chocolate-y goodness. With some candy of top of course! 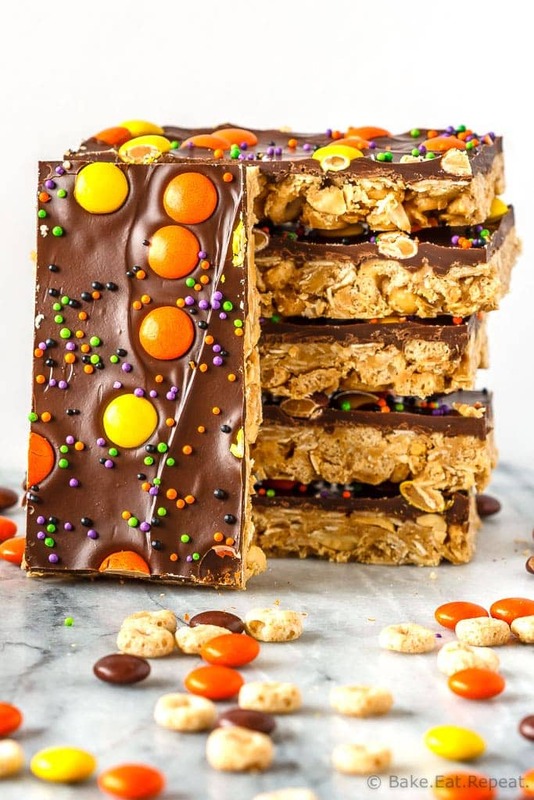 These crunchy chocolate peanut butter granola bars use cereal and oats for an easy, no bake treat - with yellow and orange candy for a fun Halloween snack! Line a rimmed 12x16 inch baking sheet with wax paper and set aside. In a large bowl, toss together the oats, Cheerios, and peanuts. In a medium saucepan, over medium heat, combine the honey and sugar. Heat, stirring, until the mixture comes to a full rolling boil. Continue boiling for one minute, stirring constantly. Turn off the heat and add 2 cups of peanut butter and the vanilla, stirring until the peanut butter has melted and the mixture is smooth. Pour the peanut butter mixture over the oat mixture and stir until it is evenly combined. Spread the mixture on the prepared baking sheet and press it down. Cover with another piece of wax paper, and use a rolling pin or a flipper to press the bars down into an even, compact layer. Refrigerate the bars for an hour before adding the chocolate layer. In microwave safe bowl, heat the chocolate chips and 1/4 cup peanut butter in the microwave at 50% power for 3-4 minutes, stirring every 30 seconds until the chocolate is melted and smooth. 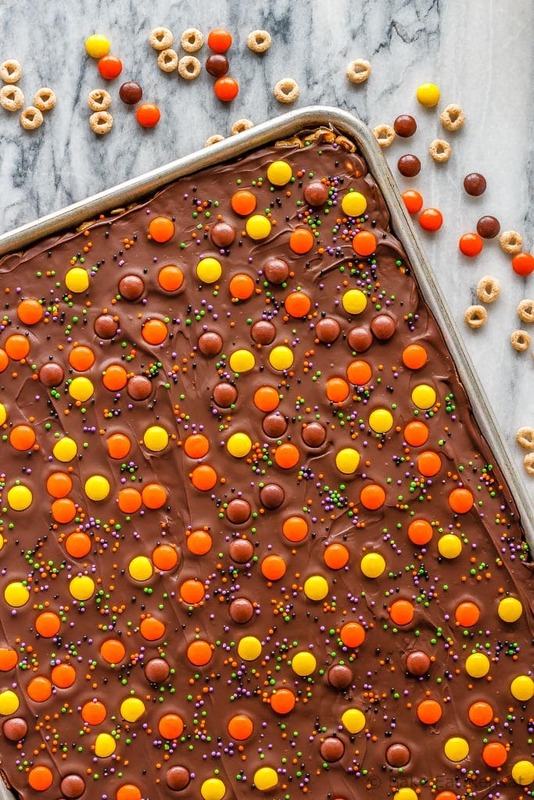 Spread it over top of the chilled bars and sprinkle the Reese’s Pieces candy and the sprinkles over top. Refrigerate the bars again, for at least two hours, and then cut into bars and store in an airtight container in the refrigerator for up to two weeks. They also freeze well for up to 3 months. You can use salted or unsalted peanuts in these bars, either will work just fine. I’ve used both regular Cheerios and the multi-grain Cheerios and both work well. Make sure to really press the bars into the pan as tightly as you can - they may be crumbly if you don’t press them in tightly enough. Amazing what can be made out of cheerios. Love it! One of my faves! These look fantastic! These look scrumptious and perfect for the season! Is it weird to say that these are the prettiest granola bars I've ever seen! Loving the chocolate layer and sweet treats! I’m sure my boys will gobble these up! Such a fun treat...and easy too. I must make something like this for my kids soon! I love these! Great after school snack for the kids! My son's 9th birthday party is this Friday! I think I may make a batch of these as a take-home treat! Thanks so much for a great recipe!